To put it simply, an API is the intermediary between two types of technology that allows them to communicate with one another. The API is essentially the middleman who receives requests from one program and sends responses from the other. With the growing number of PMS, POS, data dashboards, social media platforms, analytics tools, communication applications, etc., there is the subsequent need for more open APIs to allow for all of these systems to integrate and work together. You’ve seen our SnapShot Marketplace. There are countless hotel applications being developed as we speak and without APIs, your hotel PMS would not be able to benefit from these new applications and keep up with competitors who are advancing in hotel technology. For the sake of better understanding hotel APIs, we have identified them as categories and types. When it comes to hotel API categories, we are referring to the functionality of the API and how they are applied in a hotel. API types, on the other hand, are the technical terms that describe the protocols in an API. According to ProgrammableWeb, as of early 2018, there were over 19,000 listed available APIs and the number continues to increase with time. 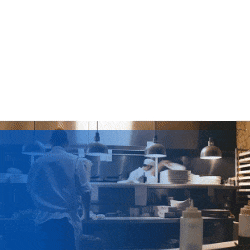 Currently, their directory lists 112 APIs relevant to the hospitality industry. Meanwhile, HTNG has created an API Registry to provide details on hotel APIs, in addition to integrations, products, and companies. With the shared goal of further integrating the technology of the hotel industry, these lists have helped to gather and present hotel APIs to the hoteliers in an industry that has traditionally been private and non-transparent. 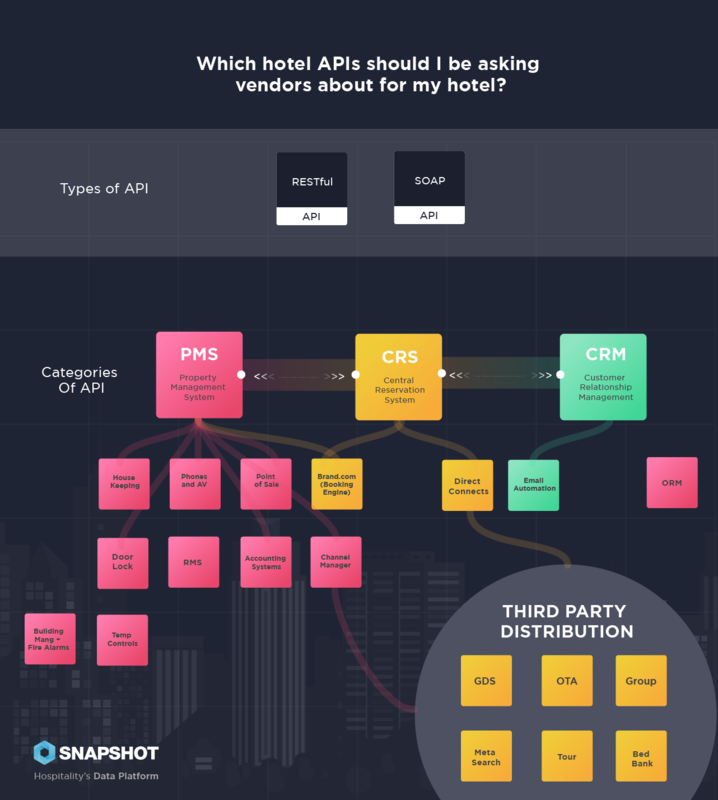 To better understand the types of hotel APIs, we have broken it down into three categories: operations, distribution, and guests and analytics. Operations APIs are more commonly referred to as the Property Level Interface and are described as pretty standard APIs available from most PMS. These APIs can be used to manage door locks, credit cards, telephones, food and beverage systems, and other similar systems. When it comes to functionality, operations APIs can integrate with your PMS or other systems to check or change room occupancy, check customer details with check-in and check-out, and manage reservations and housekeeping schedules. The systems that most frequently use operations APIs in a hotel are PMS, POS, keycard systems, and AC systems. Distribution APIs are can also be known as ARI (Availability, Rates and Inventory). Their functionality mainly consists of delivery reservations, retrieving or modifying rates and occupancy. These types of APIs are used by OTAs, booking engines, and CRS systems to distribute rates and reservations across systems. They are mostly dependent on the CRS and PMS for availability. Guests and analytics APIs provide guest information, email, and profile data. While they mainly rely on PMS, they are also often complemented by external data such as social profiles and CRS data. The main uses are revolving on personalization and marketing. In regards to practicality, guests and analytics APIs fetch or update guest information and show guest information. The systems that mostly use these APIs are customer/guest relation managers. Out of all the three categories, operations APIs are the most common one used as even small hotels which handle distribution have a credit card interface. Nonetheless, it is dependent of the establishment, only the very advanced ones will have connectivity for guest and analytics, while many others stick to operations and distribution, in some shape or form. Unfortunately, APIs aren’t as simple when it comes to the actual programming and coding. There are many different kinds of APIs, whether they are protocols or web services. Two of the most used APIs are RESTful, or REST, and SOAP, which both use various formats and codes. While most hoteliers don’t require using these technical terms for their day-to-day jobs, it is important for the decision makers in hotels to have a general understanding of the types of APIs to better manage their properties. For instance, if a general manager wanted to enhance their hotel’s PMS by integrating with a guest analytics tool, they would need to research and select from a handful of options available in the market. All of these guest analytics tools would be built by different developers using varied API types. Thus, if the general manager already had a broad idea of the different types of APIs, they would be able to make a well-informed decision without having to spend time consulting with the IT department. In order to ask vendors specific questions about their open APIs, it is best to understand the technical types and the advantages and disadvantages to each one. A RESTful API breaks down a transaction to create a series of small modules. Each module addresses a particular underlying part of the transaction. This modularity provides developers with a lot of flexibility. RESTful APIs are based on a newer and often more flexible system than SOAP APIs. SOAP is a messaging protocol that allows programs that run on disparate operating systems (such as Windows and Linux) to communicate using Hypertext Transfer Protocol (HTTP) and its Extensible Markup Language (XML). Many newer APIs are based on RESTful standards. SOAP and RESTful are web services, when there are also different types of schemas which are used to return the output from the RESTful and SOAP. Two main formats to exchange data between web services are JSON and XML. JSON is a lightweight data-interchange format. It is easy for humans to read and write. It is easy for machines to parse and generate. It is used commonly within RESTful API. XML is a data-interchange format which is older than JSON and often contains more data. Most interfaces use one of these two. It is used within a SOAP or could be also used with RESTful API. Pros - XML provides great use when considerable volumes of data with numerous attributes are to be transfer between API messages. And if the validity of the data needed to be guaranteed XML could be used in combination with an XSD, this way it could be validated (by itself XML is no more valid than JSON). Cons - Some developers may consider the format to be complex and it adds to the overhead for data processing. Which hotel APIs should I be asking my vendors about? As we all know, hotels have numerous departments from revenue management to housekeeping to sales and marketing. In order to run operations smoothly, hotels employ a PMS that covers most of these divisions. However, as there are many add-on technologies available to hotels today, the number of vendors we are using continue to grow with each application or tool we install. First off, if your hotel hasn’t selected a PMS yet, you should ask them if they provide open APIs since your PMS is the core of your hotel’s operations. If your PMS cannot connect to any of the other systems in your hotel or add-on applications, your functionality will be very limited. APIs deal with large amounts of data, so is your data safe? It’s imperative that vendors use APIs with the appropriate security measures to protect the importing and exporting of data between technologies. While open APIs grant access and connectivity with other technology software’s data, it is important to clarify with the vendor exactly what type of information you will be able to see and use. For instance, the SnapShot Marketplace API, which allows third-party developers to place hotel applications on its platform, grants access to certain data points. Currently, the SnapShot API allows other software to access transactional data from external PMS, in regards to reservations, financial transactions, and group reservations. While more and more types of data are expected to be available as APIs develop, it is still crucial to ask your vendor exactly what you will be receiving through their API and when. These security measures are also applied to Snapshots API, which is in line with industry standard. Additionally, SnapShot’s API, for example, deals with transactional data, but never touches any personal data such as credit card information. Thus, the API can still provide the data to a hotel and be used for analysis, but remains safe from leaking any valuable information.